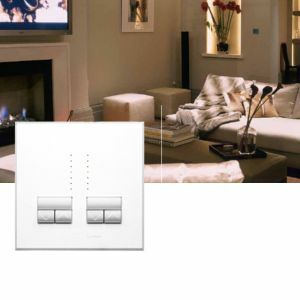 The Lutron Rania Dual Touch Dimmer is an ideal replacement for a single 2gang light switch with low voltage halogen lamps as well as normal mains voltage light bulbs. If you have a single gang switch then see the Lutron Rania Single Touch Dimmer. The Lutron Rania IR remote control touch dimmer is ideal in principle living rooms as well as bedrooms for bedside light control. If you are looking for a quality light dimmer, modern style, simple operation, then the Lutron Rania Touch Dimmer will be a perfect addition to your home. for Mains and Low Voltage Lamps.